The 260® Hobby Abrasive Gun creates an endless variety of effects in glass etching, or cuts monograms in wood or metal. The 260® can also prep wood, plastic and metal surfaces, plus curved, hard to reach areas for refinishing. Realistic weathering effects are easily achieved using this gun. 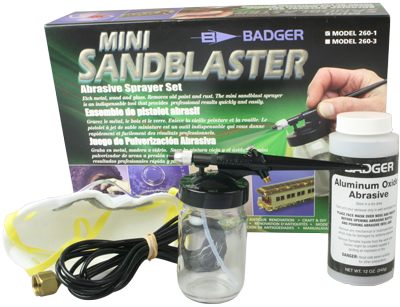 The Model 260® will handle 220 grit, or finer abrasive materials. The 260® is made of high-impact Delrin® and precision metal parts. The tip is hardened steel. All of our cutting compounds can be used with the 260® Abrasive Gun. Cleaning rust - cars, bikes, tools and furniture etc.